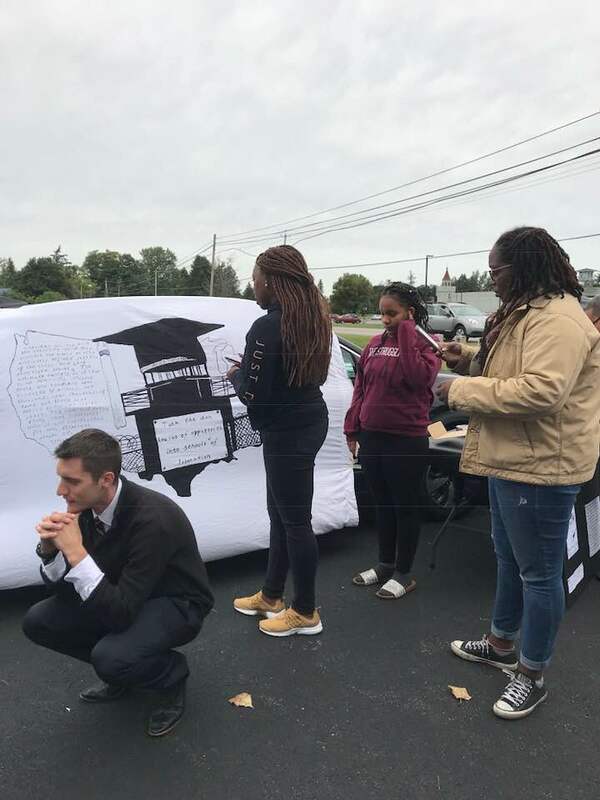 Attica, NY – On Sept. 9, a pop-up People’s Museum for the Truth of the Attica Uprising outside the gates of the Attica Correctional Facility commemorated the 47th anniversary of the Attica Rebellion. Approximately 35 people from across western New York visited the museum and joined an accompanying rally in solidarity with Attica prisoners and their friends and family. The pop-up museum started at 668 Exchange Street in Attica, N.Y., at 2 p.m. on Sept. 9. After being asked to move out of the Attica Prison Preservation Foundation’s empty parking lot (the Foundation was closed), the museum re-assembled along the shoulder of the road across from the gates to the prison. The lead curator of the exhibition, Laura Salamendra, thanked visitors for coming to the museum. She highlighted why people need to know what really happened in the prison 47 years ago. “No one was ever tried for the murders of the 39 men in the yard. No one has been held accountable for the cover-up afterward, the lies and fabrications, the insults to the families of all who died,” she said. Through banners, clippings, and mounted images, the museum provided a history of the 1971 Attica uprising. Exhibits situated the events leading up to the uprising in the broader context of peaceful prison strikes that took place in New York State. They noted the poor conditions that led prisoners to protest. According to spokesperson Hannah Dickinson, “the prisoners wanted an end to inhuman conditions; they wanted the brutality they encountered every day to stop; they wanted the prison to stop relying on solitary confinement, which is a form of torture.” As the recent nation-wide prison strike makes clear, in prisons across the country conditions have not improved but in fact have deteriorated. The anniversary of the Attica uprising marks the end of the nationwide prison strike that began on August 21, the date Black Panther George Jackson was killed at San Quentin prison, also 47 years ago. The strike, which spread across 17 states, was called in response to the violence at the Lee Correctional Institution in South Carolina that led to the deaths of seven inmates. The demands of the men and women prisoners who participated in the strike included immediate improvement to prison living conditions, access to rehabilitation, sentencing reform, and an end to the slavery conditions that fail to pay prison workers fair wages.